A mother claims she has to put her mentally-ill son in handcuffs at home because of a lack of support from mental health services. 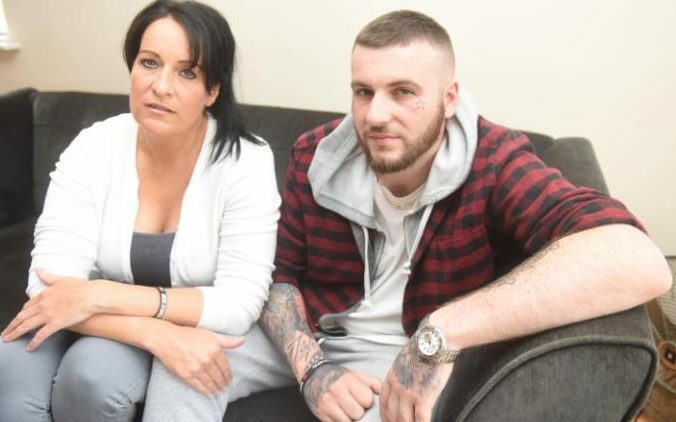 Joely Hignett alleges she has to physically restrain 24-year-old son Kyle Hignett – who has a borderline personality disorder and suffers from psychosis – to stop him from harming himself or others. The 44-year-old mother of two, from Warrington, Cheshire has released “distressing” footage of Kyle sobbing and screaming to raise awareness of his condition and said she feels “let down” by the mental health system. She claims her son’s breakdown in the video, which has racked up more than 950,000 views and nearly 5,000 shares on Facebook, was caused by him being told by doctors he was soon to be discharged. Ms Hignett, who is full-time carer to Kyle and 22-year-old daughter Tyler Hignett, who suffers from bipolar disorder, said: “I know my son is the most beautiful, kindest person in the world. “He is so respectful, he would never want to hurt anyone in the street. But when this thing takes over we have to put him in handcuffs to prevent him from killing himself or harming someone else. He gets in rages and feels extremely dangerous. “Luckily, thank God, he works with me. We just feel totally overwhelmed and scared, but no one seems to care. “We feel the mental health system is letting my son down, his family down and everybody else down who suffers every day with mental health.